Our charity collaboration with UK charity, Smart Works, has now come to an end, but we continue to love what they do to promote and support female self-belief in the workplace. Smart Works provides high quality interview clothes, styling advice and interview training to women in need. To bring this to life, we wanted to share a recent, wonderful client story. Mary had been unemployed for almost a year when she came to Smart Works. Following her visit, Mary was successful in her interview and began her new role. We hope Mary’s Case Study brings to life the impact that great clothes and good advice can have on a woman’s confidence in her ability to succeed. 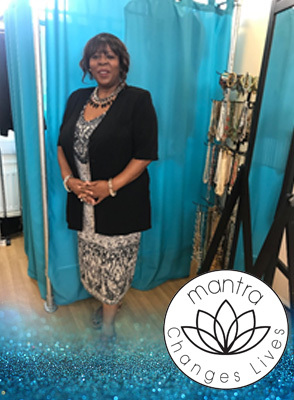 Mary was one of the last clients to visit us in July 2017 and one of our first to come back for her Second Dressing in August. She had been unemployed for almost a year and although had succeeded in getting through to the interview stage for a couple of applications, she had not been successful in getting the job. Prior to visiting Smart Works, she found the whole process of finding a job daunting and had numerous questions about the application process. Mary was referred to us by her adviser Mark from MI ComputSolutions. Our volunteer team prepared Mary for her interview the next morning and by that afternoon she had already heard that she had been offered the job. Feel inspired? To support this wonderful charity, we have created a disc pendant with the empowering mantra, 'Believe in yourself. We do’. Carrying the powerful word, 'Believe', to represent the full mantra, and with our lotus symbol below it, the disc necklace is £45 in Sterling Silver and £65 in Yellow and Rose Gold plating. In 2018 and 2017, we donated 25% of the sale of each 'Believe' necklace directly to Smart Works. What is 14 - 6?